qianshan 202 Pencil, Pen Bag organizer!! Sweet Deal!! You can put your 100/120/132/144/150/200/202 pcs colored pencils or 136 gel pens on this pencil organizer. Case Cover is made of strong polyester oxford fabric. This pencil case is extremely sturdy. You can own this for a long time use. Handy Design-Makes it very easy and convenient to carry anywhere, Perfect Holder for Various Pencils, Ideal gift for Graduation, Birthday and back to School. It has total 5 layers. Each of middle 3 layers has double sides of elastic holders which has seven of 3cm and one of 4cm on each side that can contain 25 pencils as max. Each of outside 2 layers has single side of elastic holders which has six of 3cm and two of 4cm on one side that can contain 26 pencils as max. the 3cm slot can holder 2-3 pencils or 1-2 pens, the 4cm slot can holder 3-4 pencils or 2-3 gel pens which helps group colors easily, making it much easier to choose the right colors. And it roomy for all your pencils, pens, markers, brushes and erasers / sharpeners. Ideal case for art, office, makeup supplies. 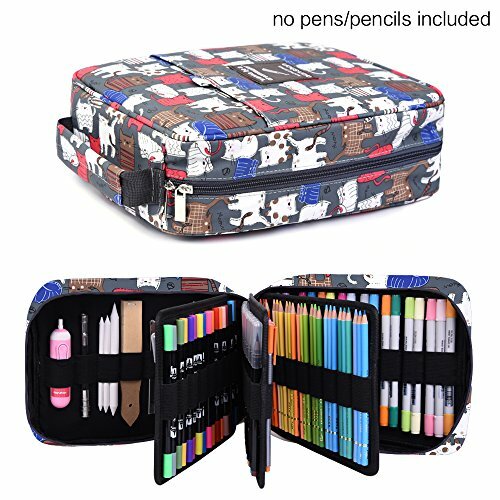 It can hold various tool like Prismacolor / Crayola / Marco Raffine colored pencil, watercolor pencil, gel pen, marker, eraser or cosmetic brush in pencil case. Extensive Applicability-Fits for your Prismacolor pencils, Crayola pencils, Raffine Marcoor Pencils and other watercolor pencils perfectly, could also apply to ordinary pencils. Note: the case is without pencils or marker pens shown in the picture, hope you can understand. The case comes with our 100% satisfaction guarantee: 100% money back policy.